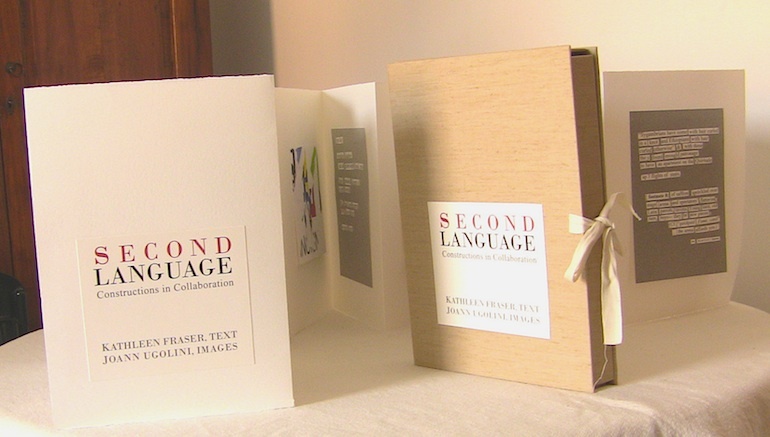 S E C O N D LANGUAGE is a codex-bound collaborative Artist Book — 20 pages/40 sides of related text and image — constructed entirely via collage methods by Kathleen Fraser and JoAnn Ugolini during the spring of 2009 while working as visiting artists in a shared studio at the American Academy in Rome. The linen box (made by traditional Roman book binders) was chosen in place of a more commonly used binding in order to accommodate the weight of Fabriano Rosapina Bianca paper whose 12” x 14” pages, when unfolded, stand upright or collapse inside the box somewhat like an accordion, to be read by turning the scored & folded pages. Each of the five sections — 4 pages/ 8-sides — is bound by library tape at the joining between sections. The written text is collaged from Fraser’s unpublished early memoir writing and from translations of classical Latin poetry and archeological folios found in the AAR’s library of ancient and classical manuscripts; these sources include epigrammatic satire from the first century Latin poet, Martial, and very recently excavated archeological records of the Vindolanda Writing Tablets, half burnt inscriptions made on wooden slabs discovered in 1995 in abandoned bonfire sites left behind in the U.K. by Roman soldiers (first century AD). All original texts were reconstructed, word by word, to evade the over-familiar narrative while importing echoes of lives still prized. Ugolini’s visual collages were constructed entirely from political posters pulled from contemporary Roman walls (immediately after elections & rain-fall/ early April 2009). These pieces continue work she has been making from Rome wall posters since the late Nineties. Having named no starting place, other than the wish to probe memory and a shared passion for the manifest presence of ancient Rome in contemporary life, they began to work. What arrived was a “second language” uncovered and repositioned from torn edges of the partially available. The original printed book is now a part of the permanent Special Collections at the Bienecke Library (Yale University), with copies in Special Collections at Brown, Stanford and the University of Delaware.